Waste-to-Energy and Municipal Solid Waste-to-Energy Conversion | Bio-Thermal-Energy, Inc. In society, there is a technical and commercial economic interest with the conversion of “waste solids to energy” such as electricity and fuels. Dr. Young has several publications in this technical area and has recently published a book on waste to energy conversion processes: “Municipal Solid Waste to Energy Conversion Processes; Economic, Technical, and Renewable Comparisons,” by Gary C. Young, Ph.D., P.E., John Wiley & Sons, Inc. (publisher), June 2010, 384-pages. In addition, Dr. Young recently developed a novel thermal process for converting the Carbon dioxide (CO2) from a gaseous stream into energy and fuels. The management/treatment of Solid Wastes (SW) by thermal pyrolysis / gasification technology is increasingly viewed as the best suitable and economically viable approach for the management of wastes such as: Residential Waste (RW), Commercial Waste (CW), Industrial Waste (IW) and Municipal Solid Waste (MSW), which can be a mixture of these wastes. Various types of thermal processes using pyrolysis / gasification technology such as but not restricted to a Plasma Arc Gasification process as an attractive commercial viability. The various types of thermal processes based upon pyrolysis/gasification technology are: Pyrolysis, Pyrolysis/Gasification, Conventional Gasification, and Plasma Arc Gasification. These thermal gasification processes are carried out in an oxygen deficient atmosphere. One additional thermal process exists based upon combustion technology (an atmosphere of excess oxygen) and is known as Mass Burn (Incineration). A key product from these thermal gasification technologies is the conversion of MSW into a Syngas which is predominantly Carbon monoxide (CO) and Hydrogen (H2) which can be converted to energy (steam and/or electricity), other gases, fuels and/or chemicals. Our population is still growing and we are producing more garbage, even with the recycling efforts in full operation. We have come to the ‘place in time’ that the momentum of “TECHNOLOGY” can help “protect human health and welfare” and thusly, the environment, by creating an infrastructure design, creation and building of sustainable MSW processes that can turn our WASTE PROBLEM into useful GREEN ENERGY for the betterment of ALL. As recognized, gasification is an old technology used for the production of energy from solid materials. In the general, gasification has been used for the conversion of carbonaceous materials into a gaseous product for the production of energy products and byproducts in an oxygen starved environment. The carbonaceous material, whether from Municipal Solid Waste (MSW) or other sources, is processed in an oxygen deficient environment with heat to produce a Syngas comprised mostly of Carbon monoxide (CO) and Hydrogen (H2). Chemical bonds of the carbonaceous materials (complex chemical compounds) break down with heat to produce the more simple and thermodynamically stable gaseous molecules of Carbon monoxide (CO) and Hydrogen (H2). The inorganic or “mineral” materials are converted to a solid rock like material, called slag or vitrified slag or ash. 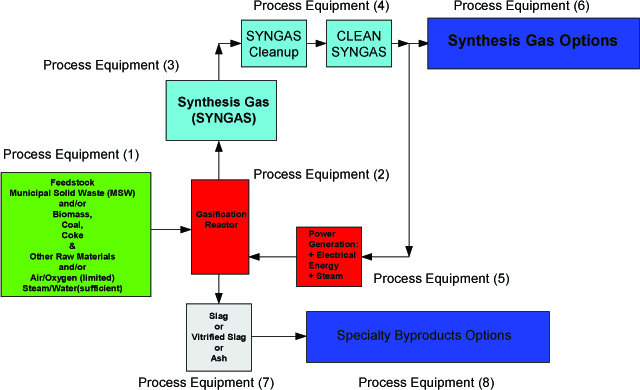 A typical process for the gasification of Municipal Solid Waste (MSW) to Syngas, energy, products and byproducts is illustrated in Figure 1. The organic components of MSW are converted into Syngas, primary product, and the mineral components are converted into slag or vitrified slag or Ash, a byproduct. For some gasification processes, some (limited) amount of oxygen is supplied to the gasification reactor to provide heat in the form of combustion heat necessary for the oxygen deficient reactions to produce Syngas, which are endothermic reactions. Sufficient steam/water is supplied to the gasification reactor to promote some Syngas reactions. Note, an exothermic reaction produces heat (output) whereas an endothermic reaction requires heat (input). Note, Equation (1.) 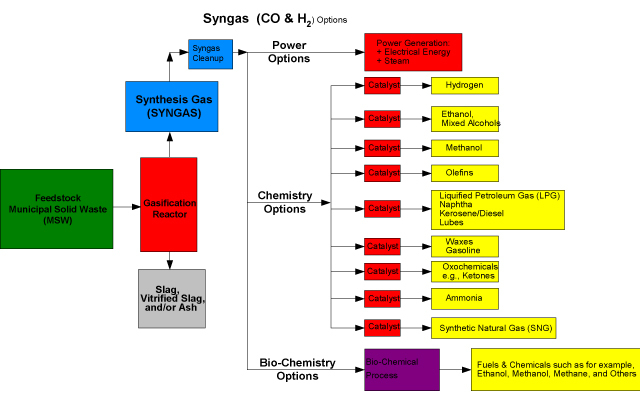 is a combustion reaction which is sometimes used in the gasification process to provide some internal (in-situ) process heat for the endothermic Syngas reactions but only a (limited) amount of oxygen is supplied so the gasification reactor environment remains conducive for the production of Syngas. The remaining process heat is supplied externally to the gasification reactor such as through the heat transfer surfaces of the reactor heating system. These basic approaches for the management of Municipal Solid Waste (MSW) are schematically shown in Figure 2 whereby the options for the Syngas are numerous. With these approaches to the management of MSW, a technical and economic evaluation of a specific case/site selection is necessary to construct a business plan to be successful. 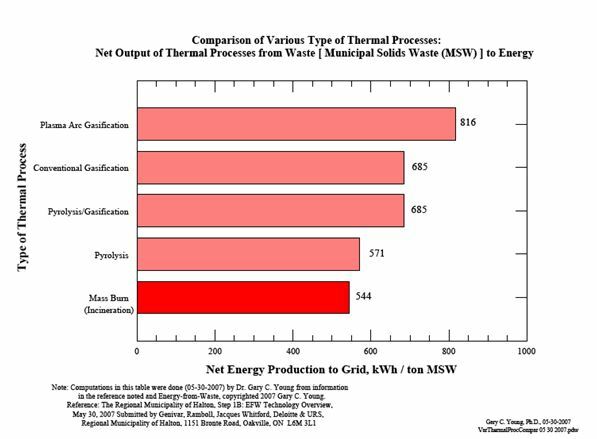 From reviewing the Net Energy Production to Grid of the various types of thermal process technologies, Plasma Arc Gasification produces about 816 kWh / ton MSW compared to only about 685 kWh / ton MSW for a Conventional Gasification technology. Thus, Plasma Arc Gasification could be considered the most efficient thermal gasification process. From reviewing the Net Energy Production to Grid of the various types of thermal process technologies, Plasma Arc Gasification produces about 816 kWh / ton MSW compared to only about 685 kWh / ton MSW for a Conventional Gasification technology. Thus, Plasma Arc Gasification could be considered one of the most efficient thermal gasification processes. For additional information, a detailed presentation and economic analysis of various waste-to-energy processes may be found in “Municipal Solid Waste To Energy Conversion Processes; Economic, Technical, and Renewable Comparisons,” by Dr. Gary C. Young, Ph.D., P.E., John Wiley & Sons, Inc. (publisher), June 2010, 384-pages.